Visitors were encouraged to roll out their own dough, then handed them off to us to fry in cast iron pans over a fire pit. The crispy breads were then topped with corn, squash and beans to make Indian Tacos and served along with a beverage inspired by Black Drink. Special thanks to the JONY crew for making it such a fun time! In a big bowl mix flour, baking powder, salt, sugar and olive oil. Stir in water until dough begins to ball up. Cover bowl and refrigerate for 1 hour. Heat about 1 1/2 inches oil in a large cast iron over medium-high heat until the oil reaches 350 degrees. On a lightly floured surface roll out ping pong sized pieces of dough into 1/4 inch thick rounds. Place dough carefully into the hot oil and fry until golden brown about 1-2 minutes. Flip over and cook opposite side about 1 more minute until it becomes the same golden brown. Remove the fry bread to a paper towel-lined plate and allow it to drain while you fry the other pieces. 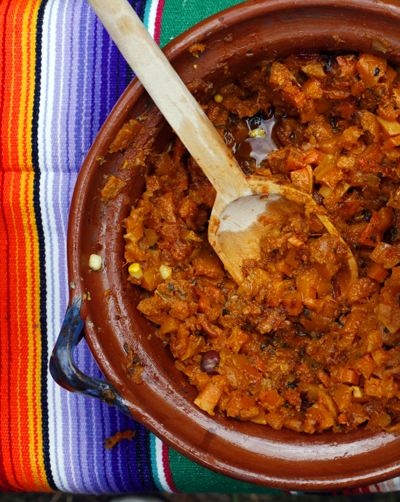 Serve warm with corn, beans and spiced pumpkin. Bring a large pot filled with unsalted water to boil. Cook the corn ears for 2-3 minutes. Remove corn from pot and let it cool a bit until it is comfortable to handle. With a knife remove corn kernels from the cob and place corn (about 1 1/2 cups) in a bowl. 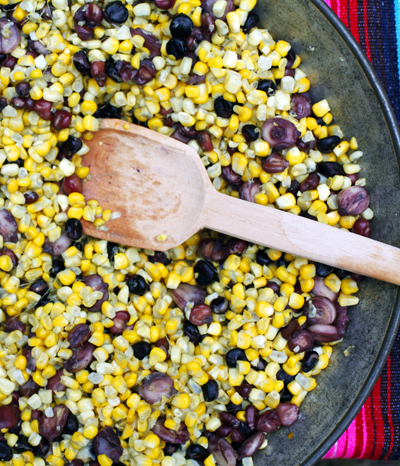 Mix with hominy, red corn and olive oil. Season with salt and set aside until its ready to use. Place beans in a large bowl and cover with cool water and let them soak overnight. Rinse beans and place them back into the pot. Add onion, garlic and bay leaf. Use enough water to cover beans by about an inch. Simmer the beans gently for 1 1/2 to 2 hours. Season with salt and set aside until ready to use. In a bowl mix together sage, olive oil, garlic, ginger, sugar and coriander and cumin. Toss squash in the mixture. In a large pot, over medium low heat, cook pumpkin mixture, stirring occasionally until soft, but not mushy, about 7-10 minutes. Season with salt and pepper to taste. Set aside until ready to use.